One definition of duality is: consisting of two parts or elements or having two like parts, having a double character or nature. It is also a view of human beings consisting of two irreducible elements as matter and spirit. In mind/body dualism it is maintained, for different reasons, that people's "intelligence" (a faculty of the mind or soul) cannot be identified with, or explained in terms of, their physical body. In mathematics duality is defined as symmetry within a mathematical system such that a theorem remains valid if certain objects, relations, or operations are interchanged, as the interchange of points and lines in a plane in projective geometry. Duel*Ality will explore relationships and the many sides of the interactions that the two characters Duel, played by Jimmy Miklavcic, and Ality, played by Elizabeth Miklavcic, encounter. This telematic work will focus on the relationship between two people and the way this duo encounters and functions in this technological world. It will also look at the relationship of man and woman, of human to computer, of software to hardware, the relationship of live creativity and projected elements and the relationship between creative elements and how the audience perceives them. The script developed by Elizabeth and Jimmy Miklavcic will include a series of monologues and dialogues between Duel and Ality as they wrestle with each other and their expressions, using their computers as extensions of themselves. This telematic play will show the human side of technology, revealing that everything and everyone has at least two sides. Read the Artists of Utah preview article Inside a Black Box by Dale Thompson. 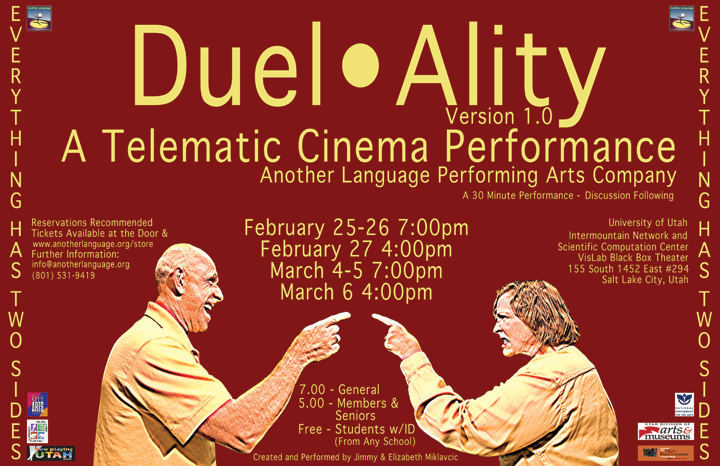 Duel*Ality performances will be held February 25-26 at 7:00pm and February 27 at 4:00pm & March 4-5 at 7:00pm and March 6 at 4:00pm. The performance space will be at the University of Utah Intermountain Networking and Scientific Computation Center and will be in the Visualization Lab Black Box (VisLab) on the second floor, room 294. Students from any school will receive free admission, $7.00 general, $5.00 Another Language members and seniors. The VisLab will only seat 15-20 people, so reservations are highly recommended and can be made through the Another Language Web Store Box Office or by calling the Another Language Office (801) 531-9419 or by emailing info(at)anotherlanguage.org. An audience discussion will follow the half hour performance. Download CHPC Spring 2011 PDF. Another Language Performing Arts Company holds a reputation for creating unique, cutting edge work and Duel*Ality will continue in the tradition of the unexpected. Be a part of this one of a kind event by attending the University of Utah performances. Information on live streaming viewing options will also be available.